Increasing demand of polymer from automobile and construction industry in BRICS nations coupled with rising concerns over toxicity will drive the non halogenated flame retardants market size in future. Polymer is touted to substitute steel in automotive manufacturing process to reduce weight and advance efficiency which may positively influence the non halogenated flame retardants market share in near terms. Polymers are highly inflammable and catch fire due to overheating, electric failure or lighters. Demand supply mismatch for key raw materials including aluminum hydroxide, nitrogen hydroxide and phosphorous may act as a restraint for non halogenated flame retardants market. High demand for aluminum and phosphorous hydroxide from manufacturing industries may hamper the business outlook. Non halogenated flame retardants market size from aluminum hydroxide was valued over USD 300 million by 2015. It is widely used fillet in rubber, FRPs and polymers. It is an excellent smoke suppressant and is extremely affordable. Phosphorus based non halogenated flame retardants market share will grow at over 8%. Organic phosphorous compounds will evolve due to their superior smoke suppressant properties. Chlorine and bromine based fire suppressants are toxic in nature. Environmental regulation against usage of chlorine and bromine based fire suppressants will growth. Global non halogenated flame retardants market size from polyolefins applications exceeded 300 kilo tons in 2015. These products require retardant material like PE, LLDPE, LDPE, PP, EVA & MDPE. Polyolefins are widely used in wires in construction, transportation and electrical industries. Epoxy resin applications will register growth over 7% during the forecast period. Epoxy resins are used in paint coatings, adhesives and electronic equipment. Smoke suppressant additives are used to improve its fire-resistant properties. Non halogenated flame retardants market from construction sector is expected to exceed USD 1 billion by 2024. Demand for fire safety material in construction sector will drive growth. Building materials, wires, switchboards and cables in the construction business use polymers. 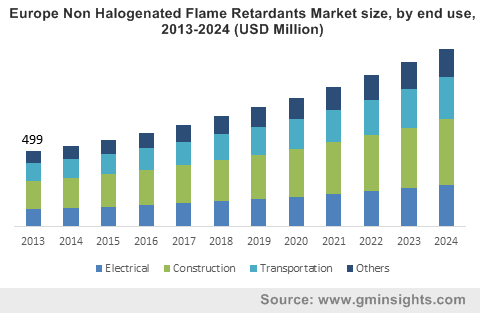 Global non halogenated flame retardants market would experience a significant growth subject to increasing adoption of polymers among automotive industry. Growing adoption of polymers for electronic functions in automotive industry will complement this development. Performance matrix of products are durability, protection, insulation and lower heat and smoke emission are pertinent to the adoption of product. Use of polymer reduces weight of automobiles by 10% resulting in fuel saving. Additionally, lighter vehicles help to reduce fuel emission levels. Propylene, ABS and other high performance polymers are used for automotive manufacturing. Non halogenated flame retardants market size will surpass USD 1 billion revenue by 2015 with over 8% CAGR till 2024. Asia Pacific will witness gains over 8% owing to the large-scale spending in India and China. Presence of manufacturing facilities coupled with fire safety concerns will boost product demand. Large scale automotive production in Latin America will drive business growth. Rise in average income from developing economies in India and China may favor the packaging and construction industry. In 2015, over 40% of Asia Pacific construction spending was in China which translates to more than USD 1 trillion in revenue. Industry analysis suggests that the global spending on construction exceeded USD 9,000 billion in 2015. Global non halogenated flame retardants market share is concentrated with top 4 companies catering to over 30% of the demand. Nabaltec, Albermarle, Israel Chemicals and BASF are key players. Other companies in the business include Clariant, Chemtura, DSM, Italmatch Chemicals, Thor Group, Huber, FRX Polymers and DuPont. Non halogenated flame retardants market is broadly categorized into metal hydroxides and phosphorus based. There are toxicity concerns surrounding the products belonging to these categories. Companies are forced to reduce the levels of toxic additives as per government regulation. Alternately, retardants that are eco-friendly will experience an increase in demand. They are applied in rubber, textiles and plastics industries out of which the plastic industry is a major end-user.